Mutual grounds& Ex-Servicemen requests- Certain Instructions Issued- Reg. 2. This office Proc.Rc.No.686/Estt.IlI/2018 dt. 16.05.2018. 3. 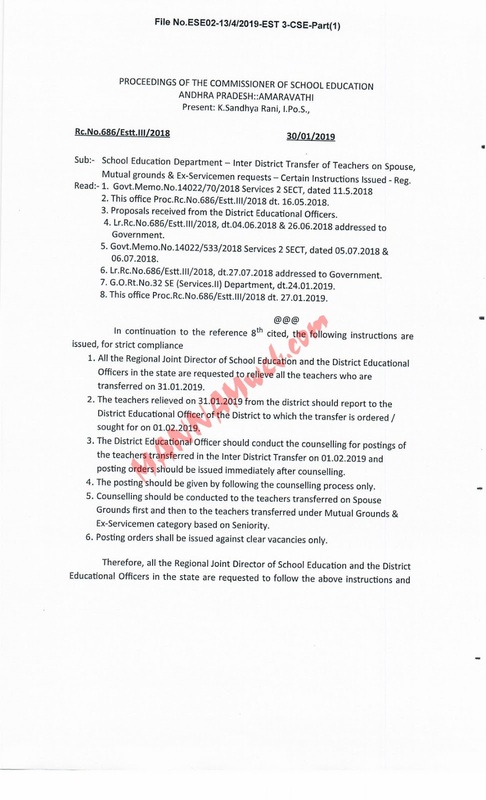 Proposals received from the District Educational Officers. 6. Lr.Rc.No.686/Estt.lII/2018, dt.27.07.2018 addressed to Government. 7. G.O.Rt.No.32 SE (Services.Il) Department, dt.24.01.2019. 8. This office Proc.Rc.No.686/Estt.III/2018 dt. 27.01.2019. 4. The posting should be given by following the counselling process only. 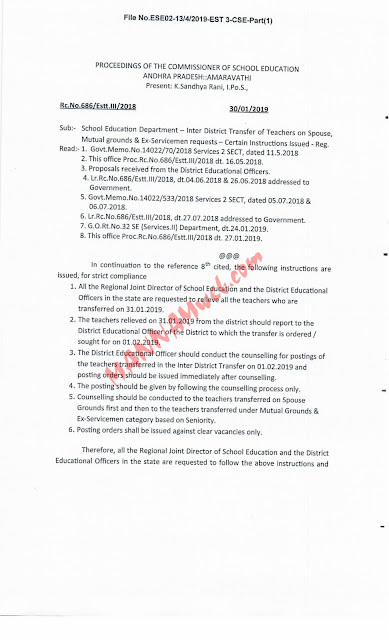 District Educational Officer of the District to which the transfer is ordered/sought for on 01.02.2019.
the teachers transferred in the Inter District Transfer on 01.02.2019 and posting orders should be issued immediately after counselling. Ex-Servicemen category based on Seniority. 6. Posting orders shall be issued against clear vacancies only.